If you are an existing patient, we would like to thank you for trusting us with your dental care. If you are a new patient we would like to welcome you to our Menlo Park Periodontics & Implantology office. 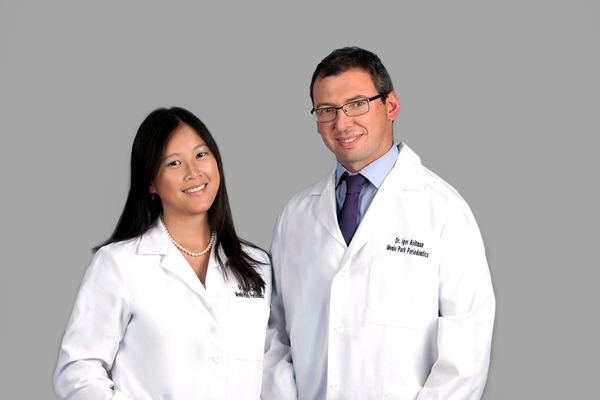 Our Doctors, Dr. Joyce Cheng , Dr. Igor Roitman , and Dr. Terry Fiori are committed to providing you with the personalized, high quality specialty dental care that you deserve. Drs. Cheng, Roitman, and Fiori are periodontists that specialize in the treatment of gum disease, soft tissue reconstructive plastic surgery and dental implants. Dental implants are a great way to replace missing teeth and also provide a fixed solution to having removable partial or complete dentures. Dental Implants are very natural looking and can enhance or restore a patient’s smile! Click here to learn more about dental implants. We genuinely hope this site is helpful to you in learning more about our Menlo Park Periodontics & Implantology practice, periodontal services, dental recommendations, referring doctor information & financial information. Please browse through our website and be sure to give us a call @ 650-327-0625 if you have any questions or would like to schedule an appointment. Menlo Park, California Periodontists at Menlo Park Periodontics are dedicated to Periodontics such as Periodontal Disease Diagnosis and Treatment, Crown Lengthening, Dental Implants and more.